Calcium is well known for its role in building strong bones, but did you know it also performs several other important functions in your dog’s body. Calcium is a mineral that must be consumed through your dogs’ diet, it cannot be made inside the body. Over 98% of total body calcium is stored in your dog’s bones, which works as a mineral bank. It is deposited and withdrawn from your dog’s bones on a daily basis. Calcium is an interdependent mineral that works synergistically with co-factors to deliver its benefits. Calcium & Magnesium are primarily responsible for maintaining a healthy bone mineral balance in your dog. Vitamin D is an essential factor in the absorption of calcium and magnesium. Having the right balance of calcium is KEY for optimum health. Any imbalance in either deposits or withdrawals can cause major health issues. For instance, too much calcium can cause a harmful condition called Hypocalcaemia in dogs. High calcium levels can cause serious underlying diseases such as kidney failure, adrenal gland failure, and many other harmful diseases. On the other hand, dogs that do not have enough calcium can have hypocalcemia. When there is a calcium deficiency, the body continues to need calcium for its vital processes. As a result, calcium will be withdrawn from the bones. Over time, this can result in weakening of bones and can lead to different bone disorders such as hip dysplasia. Calcium deficiency can cause general bone and joint weakness, pain and put your dog at a high risk for fractures. 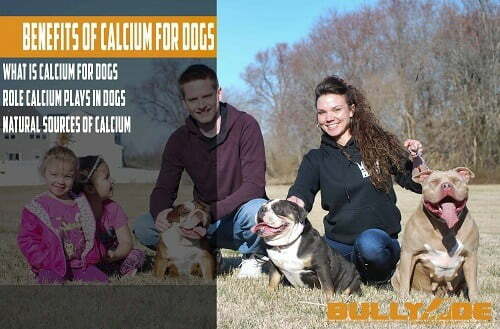 Calcium is important for all dogs. It helps keep your dog’s nails, teeth, and coat healthy. Here are a few other roles calcium plays in your dog’s body.